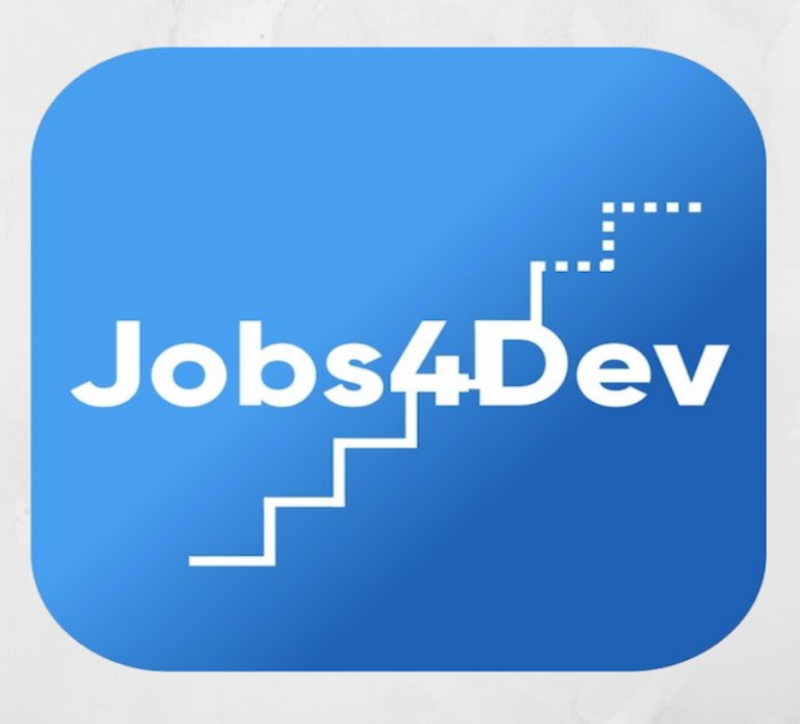 Jobs4Dev is now available! 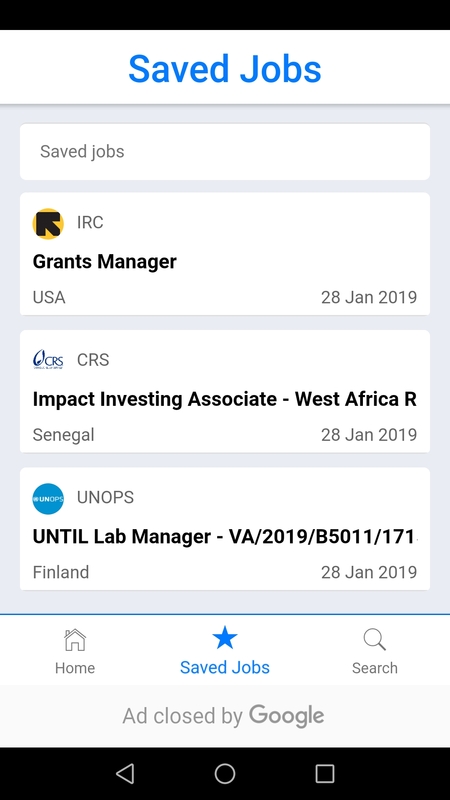 This app provides an intuitive and easy access to thousands of job offers delivered by the most reputed International Organizations, NGOs, UN agencies and foundations as well as the most relevant national and local NGOs. 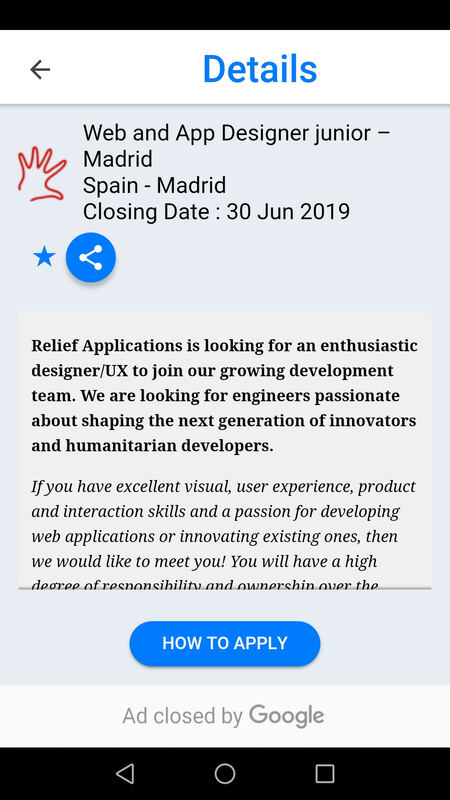 Any social or humanitarian worker knows how easy is to feel frustrated when surfing the web during job hunt. There are plenty of resources out there but they are scattered and usually still not adapted to mobile devices. 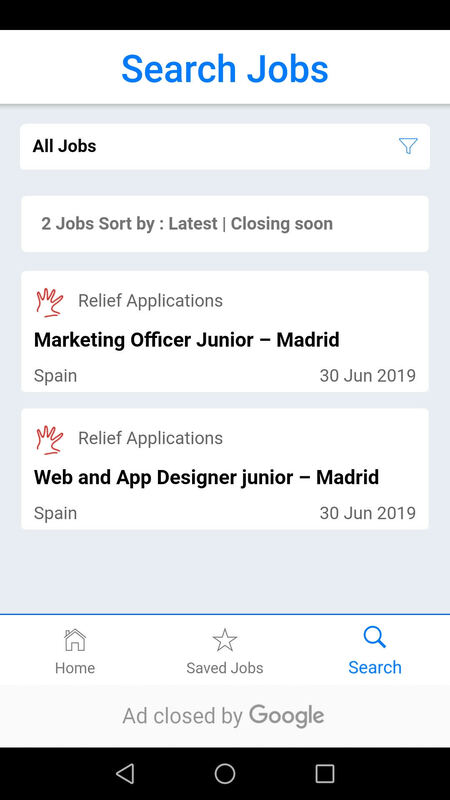 We at Relief Apps want to help you find the role that fits you best with Jobs4Dev. Go to Play Store or App Store and download Jobs4Dev. It takes just a few seconds. 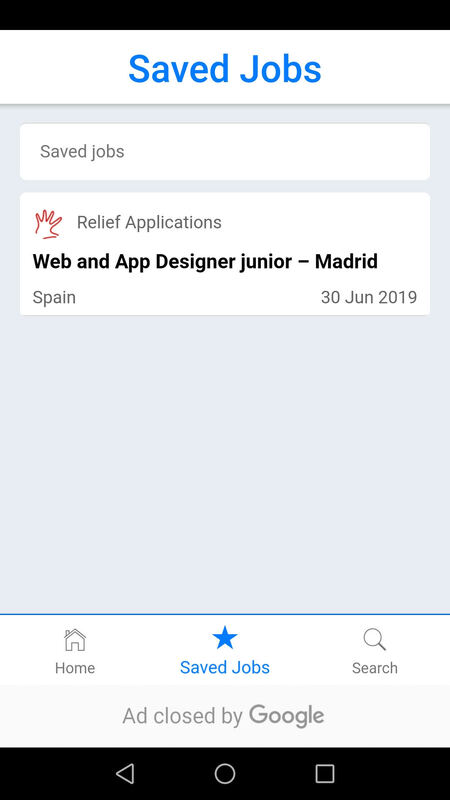 Once Installed open the app and begin by clicking on Search. No register needed! 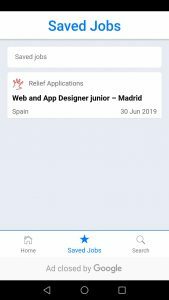 Press on Search Jobs. All the results following your criteria will be displayed. By default you will be asked to introduce a Keyword/Job, the country or city and years of experience. 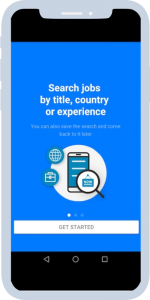 You don’t need to fill them all, you can search for a position worldwide or take a look to any offer in your area. Do you want to be more specific? No problem. 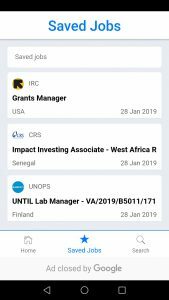 Display the additional filters and select type of position (consultancy, Internship…), Career Category (Administration/HR, Project Manager…) and more. Have you seen something interesting? 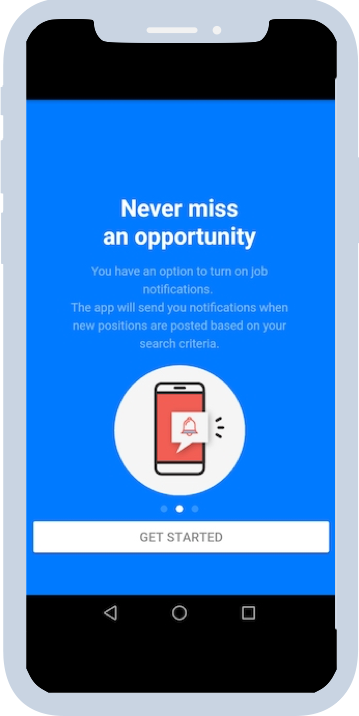 Just select it and you will access to a job description and how to apply. 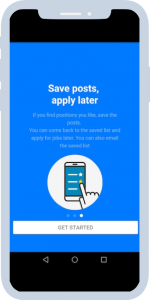 Maybe you prefer to update your resume or prepare a cool cover letter before applying. 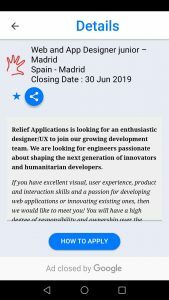 You can save this job or share it with others. We want to save you time. 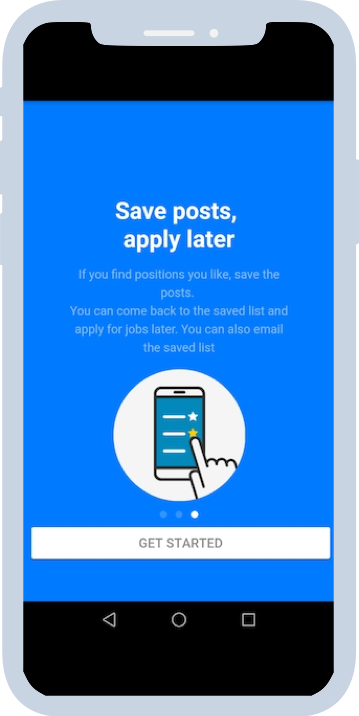 Next time you enter Jobs4Dev you will be able to return to your last searches and your saved jobs. The rest is in your hands. Good luck in your job hunt! 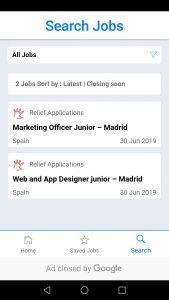 Jobs4Dev uses the Reliefweb.int job board API, one of the biggest boards for humanitarian and social professionals that makes it the best source for those seeking to work in international organizations and NGOs worldwide. Great work. I have a suggestion: what about applying a subscription option. In other words, one subscribe his/her email and then receive mails with the new announcements or vacancies.